MAINTENANCE FREE & VERY WELL CARED FOR!!! This beautiful, well-kept twin home located in Meadow Green is carefree with approximately 1,468 sq. ft. of above living area and approximately 1,308 finished sq. ft. in the lower level for a total of 2,776 finished sq. ft. The home has just been completely repainted and new pad and carpet. The home, featuring a great open floor plan, has 4 bedrooms plus 2 ½ baths. The kitchen cabinetry and counter space is abundant with all custom-made cabinets and built-ins. The master bedroom has an enormous closet and a master bath w/double sinks, separate tub and shower. The home features smooth-finish walls on the main level and antique nickel door and cabinet hardware. There is main floor laundry with laundry sink and abundant cabinetry. The home has a natural gas fireplace with built-ins, all appliances including refrigerator, range, microwave oven, newer dishwasher, washer, dryer, water softener, dehumidifier, R/O system and TV’s. There is a bay window in the living room with all major rooms having south-facing windows. The home has a forced air furnace and central a/c. 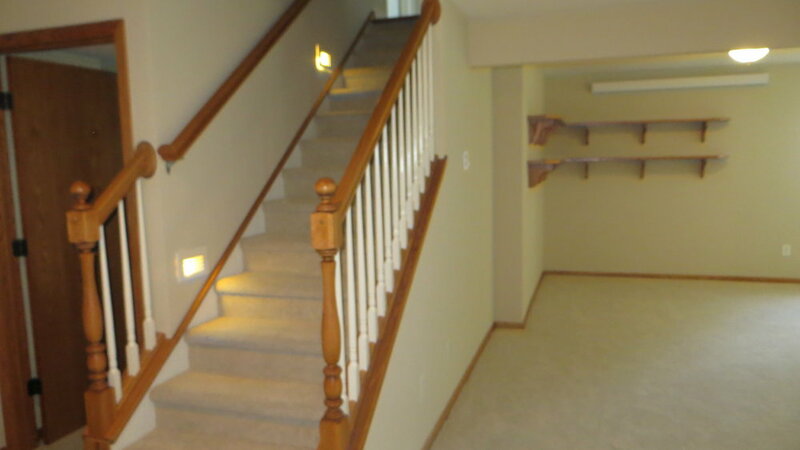 There is an open stairway to a completely finished lower level with supplemental heat for complete comfort. This is an impeccably maintained, one-owner home also featuring an attached, insulated, 2-stall garage with over 500 finished sq. ft. The property has snow removal, mowing, water and sewer included in monthly association fee. Meadow Green has a community room and is situated close to churches, HyVee, Brookings Clinic/Hospital, shopping centers and Edgebrook Golf Course. Conveniently located in a peaceful and beautiful neighborhood, this property is perfect for anyone looking to live maintenance free with everything on one level! We invite you to inspect this property any time. For additional information, contact Auctioneers or go to www.burlagepeterson.com. COME PREPARED TO BUY!!! TERMS: 10% non-refundable earnest money deposit due day of sale with balance due on or before July 25, 2018. Title Insurance and Closing Fee split 50/50 between buyer and seller. RE taxes pro-rated to closing date; sold subject to confirmation of owner. This property is sold subject to existing easements, covenants, restrictions and reservations. Information contained herein and all statements made herein believed to be accurate but not guaranteed. Statements made day of sale take precedence over all written material. Burlage Peterson Auctioneers & Realtors, LLC and Century 21 represent the sellers in this transaction. Scott Hodges of Century 21 is a family member of the seller.